The orange minivet (Pericrocotus flammeus) belongs to the family of cuckooshrikes and minivets, the Campephagidae. 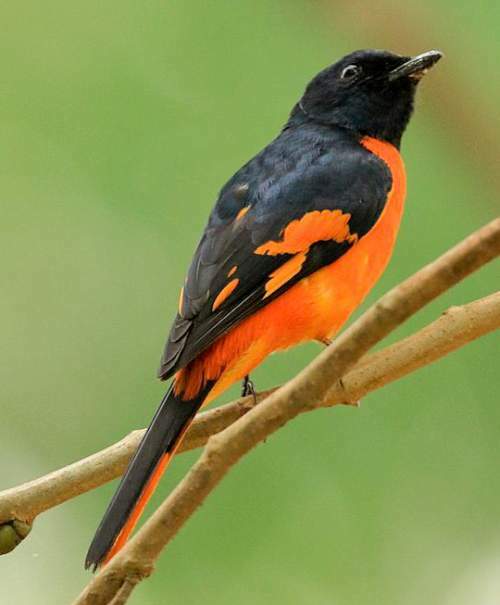 The orange minivet species is distributed in southwest India and Sri Lanka. This minivet species was formerly considered a subspecies of the scarlet minivet. These birds are monotypic species. The orange minivet (Pericrocotus flammeus) is a medium sized minivet, measuring 18 to 23 cm in length and weighing 20 to 25 grams. The male orange minivet has glossy black head, chin, throat and mantle. The wings have orange patches. The underparts, rump and undertail coverts are orange. The tail is black. The female has gray upperparts and yellow underparts. The supercilium is yellow and the lore is gray. The irises are dark brown. The rump and uppertail are black. The bill is black and the tip of the upper mandible is hooked. The irises are black. There is a dark gray eye-ring. The legs and feet are gray. The call of these species is a loud, whistling "sweep..sweep..sweep" or "weep..weep..wip..wip" sound. The orange minivet species (Pericrocotus flammeus) was earlier considered nominate subspecies of scarlet minivet (nineteen subspecies). It is now elevated as a monotypic species. It is distributed in southwest India and Sri Lanka. In India, these minivet species are distributed in the states of Gujarat, Maharashtra, Karnataka, Goa, Kerala and Tamil Nadu. 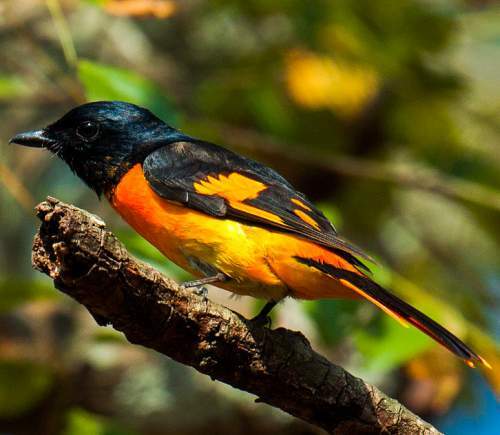 These orange minivet species have medium forest dependence. They normally occur in altitudes from 0 to 2000 meters. The artificial ecosystems and habitats of these species includes rural gardens and plantations. The natural ecosystems and habitats of these species include tropical and subtropical moist montane forests, semi-evergreen and deciduous forests, tropical and subtropical moist lowland forests and swamp forests. The diet of these orange minivet species consists mainly of insects. Beetles, grasshoppers, locusts, crickets, moths, caterpillars and spiders are their primary food. These minivet species glean insects in the foliage. They also feed by flycatching. They form small foraging flocks. The breeding season of these orange minivet species is from June to October in peninsular India. The laying season is from February to May and also during August and September (second brood) in Sri Lanka. These species are monogamous. They nest high up in top story. The nest is cup-like structure woven with grass, twigs and spiders' webs. The clutch contains two to four spotted pale green eggs. The incubation is mostly done by the female. These orange minivet species are non-migratory resident birds. The populations in higher altitudes descent to lower levels in winter. 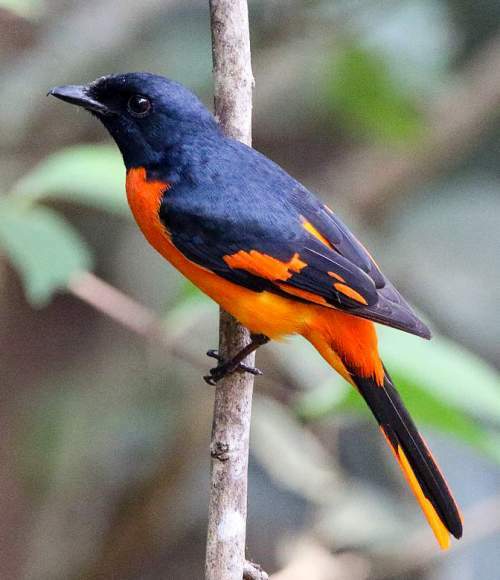 The global population size of the orange minivet (Pericrocotus flammeus) has not been quantified. The overall population trend of the species is considered to be stable. In most of its range, this species is reported to be scarce to common. The generation length is not known. Its distribution size is not known. 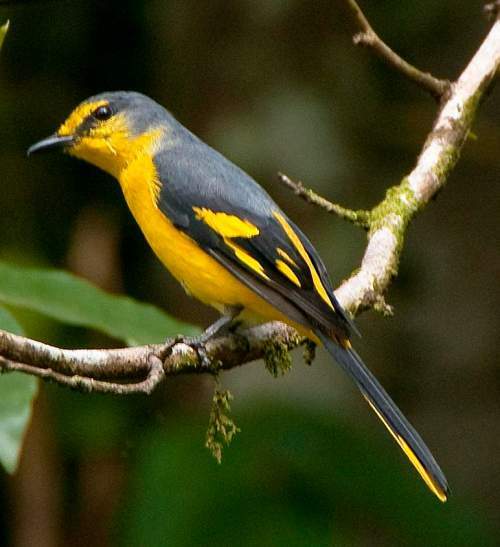 The orange minivet (Pericrocotus flammeus) does not approach the thresholds for being Vulnerable, either under the range size criterion, or under the population trend criterion or under the population size criterion. The CITES (Convention on International Trade in Endangered Species of Wild Fauna and Flora) status is ‘Not Evaluated’ for the orange minivet (Pericrocotus flammeus). The Pericrocotus flammeus is closely related to Pericrocotus speciosus. Current topic in Birds of India: Orange minivet - Pericrocotus flammeus.